The new slave cylinder, hose and line are all in place. This is a pretty fiddly operation as the join of the line and hose is above a bracket which is obstructed by the starter motor. The best way to do this I found was to first attach the hose to the bracket with the fixing nut and then with the cylinder loose, screw the other end of the hose to the cylinder, rotating the cylinder to do so. 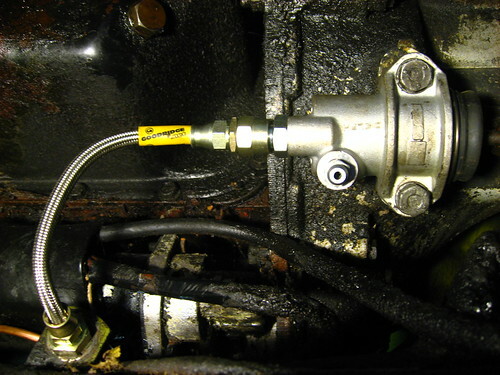 With both ends of the hose secured, the cylinder can be bolted to the chassis. The awkward bit is now getting the copper line screwed to the bracket and hose, not easy but persevere, ensuring that the copper line is falling vertically into the bracket. One note on the new cylinder - the new ones are shipped with the bleed screw in the wrong hole (I believe to allow it to fit in the box). Make sure you swap it around before fitting. You'll soon realise if you haven't - as I did - because the clutch hose would be awfully tight if you try fitting it as shipped.